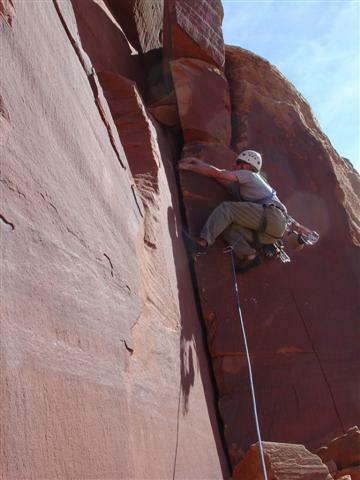 The South Face of the South Six Shooter is often called Utah's easiest tower climb. 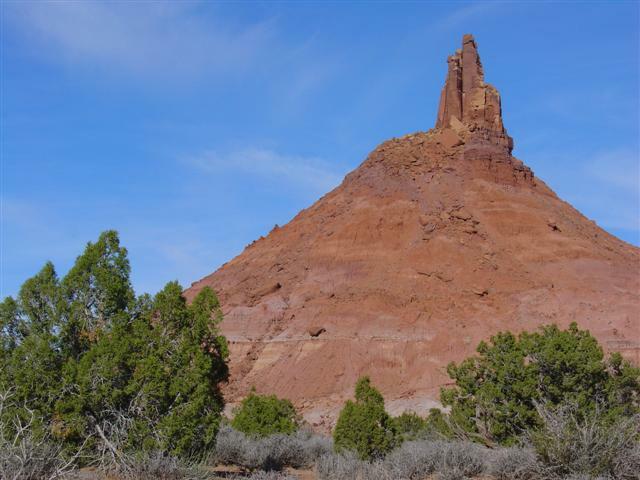 The tower stands more than 1,000 feet above the surrounding valley just east of the Needles District of Canyonlands National Park. We were at Indian Creek getting schooled on crack climbing for a few days and wanted to climb this awesome feature while there. It involves two pitches of roped climbing that is mostly scrambling but has a few stout moves including the very exposed, poorly protected 5.7 mantle just below the summit. This is one of those things that everyone should do at some point in their lives. 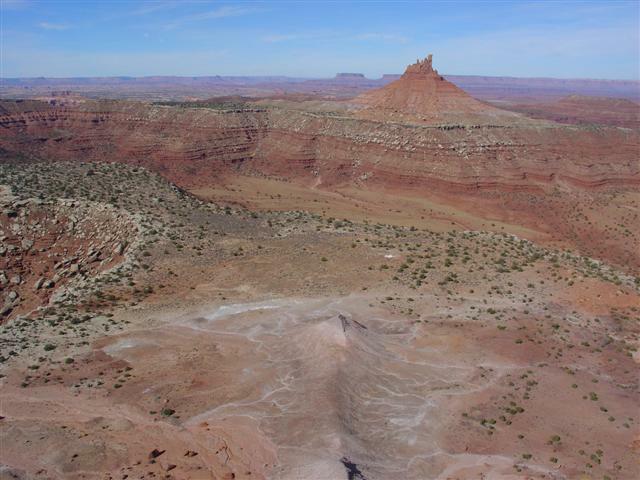 Standing on a piece of 6'x15' rock a thousand feet above the valley floor with an awe-inspiring view of some of Utah's most beautiful canyonlands is not to be missed! From our camp near Bridger Jack we drove west on highway UT211 and turned south on the signed Davis Canyon road. This is a 4WD road that spends time driving over slickrock and through the Indian Creek wash at times. We drove on this road about four miles stopping where the base of South Six Shooter nearly extends into the wash. We noticed a truck up ahead with two people sleeping on the ground next to it. I recognized the truck as my friend Aron's and went to talk with him and his girlfriend. They had climbed the route the day before with him leading both pitches and the climb taking them 6 hours or so. I was impressed with him leading the route given his handicap and they were obviously stoked to have climbed it. He gave us some beta and off we went. The approach follows a well cairned trail to the base of the talus cone below the tower. Some steep loose hiking took us to the base of the route which was marked by someone placing their chalked hand on the dark sandstone. There is also a small pictograph about 30 feet up from the base of the climb. The approach took us about 45 minutes. Roger and Bill would be climbing together and they racked up with some small to medium cams and a small assortment of nuts. The biggest cam we took was a #2 BD and that was perfect. Roger started up on lead and commented that it was mostly easy but there was some loose rock on the ledges to look out for. Roger making the moves through the 5.5 chimney section of the first pitch. Roger was soon out of view and the rope was moving quickly. 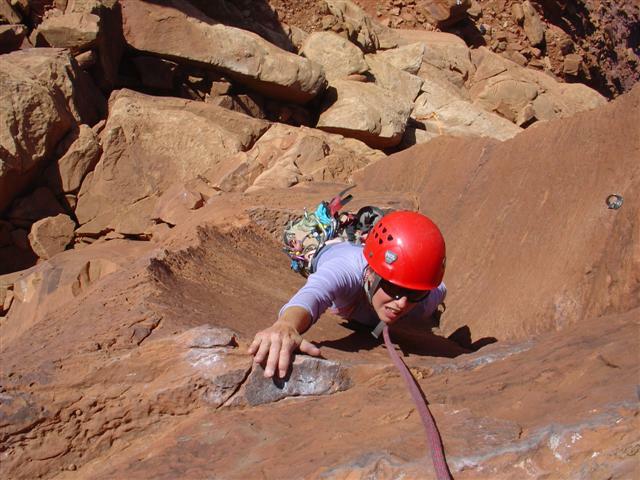 He soon called "Off belay" and began to bring Bill up. Some descriptions talk about setting a belay at the top of the first 5.5 chimney but the rope drag wasn't too bad so Roger had carried on a bit more to a nice, sunny ledge below the last pitch. As Bill climbed up following Roger, I started up on lead and followed close behind Bill. The climbing was fun and enjoyable with nothing posing any major difficulties. After the short 5.5 chimney I made some more scrambling moves to join Roger and Bill on the sunny ledge below the second and final pitch. I setup a quick anchor, called to Allison that I was off and then brought her up as Bill started up leading the second pitch. Bill starting up the second pitch with some 5.6 moves. Bill made quick work with the second pitch making sure to call out the crux mantle when he arrived there and was on top before Allison arrived at the ledge. 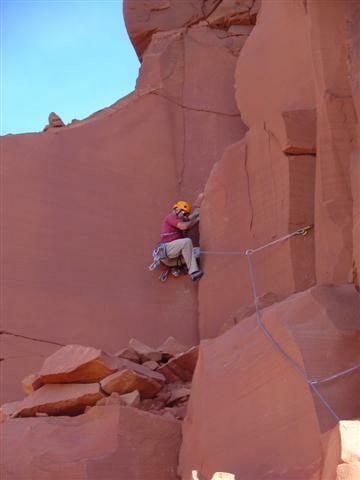 Bill clipped into the two bolts on the summit of the tower and began belaying Roger up. Meanwhile Allison and I enjoyed the increasing view from the warm ledge anticipating the feeling of standing on our first desert tower. I collected the three pieces of pro I had placed on the first pitch from Allison and began up the second pitch. The initial moves are a fun and confident layback to gain another nice ledge before moving right on the ledge to another good crack just below the crux mantle. Before I knew it was standing at the crux mantle that promised to be exciting given the exposure. Bill had left a sling hanging from the bolt above the mantle move so that I had some protection for the move. This was a nice gesture and offered the reassurance I needed to mantle up and then make two more moves to the summit! The day was stunning with nearly perfect blue sky all around and no wind. I found a decent cam placement on top and clipped a nut that Bill had placed to set the anchor to bring Allison up. She motored through the initial moves and was soon at the mantle move. She made the move look easier than I did, no doubt, and soon joined the rest of us on the summit. The view of the La Sal Mountains to the north and the Henry Mountains to the southwest was wonderful. Both mountain ranges had a fair amount of snow on them and the contrast between the snow and the dry canyons surrounding us was cool. Looking west towards the Needles District of Canyonlands with North Six Shooter in the foreground. After the obligatory summit shots we setup one rope for the first short rap down to the nice ledge. Another 30m rap from there got us down back to the base of the climb. The hike out was very nice in perfect temperatures but it marked the beginning of our return back home that day. We'll definitely be back though! Written by Jason Halladay on 08 November 2005 for TheMountainInstitute.com.